What was the best thing shown at Computex 2012? That is easy, the Viewsonic VP3280-LED monitor was by far the best. That said, they also had two other products that no one else on the floor did, and one simply stopped traffic. The traffic stopper is actually not one but three monitors, the 38″ EW3842, 29″ EW2962, and 19″ EW1930. These monitors aren’t really all that useful for normal PC work, they are aimed at the digital signage market. Why? They have rather odd resolutions and aspect ratios, all borderline painful for desktops, but damn near perfect for digital signage. As you can see, these monitors are not 16:9, 16:10, or even 4:3, they are simply weird. The EW3842 above is 16×4.2 form factor with 1920*502 pixels displayed. The EW2962 is slightly less extreme at 16×6 with 1366*512, but the EW1930 takes it the other way with a 16:3.4 aspect ratio and 1650*350 pixels. These extreme aspect ratios make the trio useless for desktop work, or even movie viewing, but perfect for menus, informational displays, and placement in areas that you would not expect to see a monitor. Take a look at the EW1930 below laid out vertically, big box retailers will eat this stuff up for added upsell and in-store ad placement. Weep for our society, but it will sell. Moving on to the best thing SemiAccurate saw at Computex, we have the VP3280-LED monitor above. 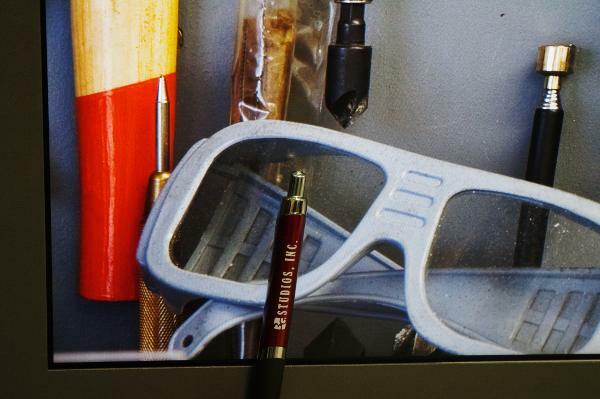 It looks plain, the image on it is fairly unremarkable, and there is a tacky pen in front of the image. Worse yet, less than 1/4 of the damn thing is in the frame. Fire the photographer, and pick a new best of show, right? Wrong. The VP3280-LED may have a dull bezel, but it is a 3820*2160 rez true 10-bit 88% NTSC color gamut LED backlit panel. That more than makes up for a mildly dull case. Pictures don’t do this panel justice, as you can see from the above image, zoomed in from the original above that, you can actually see pixels if you try. Luckily, you need a 14MP camera, a really nice Pentax K-7 in this case, and place it as close as your lens can focus. If you do that, as the author did, you can pick out individual pixels, but from the same distance, about a foot away, your eye isn’t good enough. That said, of the 25 or so images captured to get the one above, 22 had enough minor lens, sensor, and other issues to make the pixels indistinguishable. In the end, the VP3280-LED was a traffic stopper. Most people didn’t bother to look closely, but if you paid it more attention than a casual glance walking by the Viewsonic booth, it was astounding. Nothing else at Computex came close. The price was not set at the time of the show, but expect them to be shipping in Q4, and cost about as much as a decent mid-size family car. That said, this Quad-HD panel is worth it, and if panel prices drop at the usual 30% rate per year, it won’t be long before these are affordable for multi-screen gaming. If you think about it, not being able to see pixels means not being able to see jaggies. Not being able to see jaggies means no need for AA, No AA means vastly faster frame rates and better looking images in 3D games. How can you loose? The sooner these are priced sanely for mere humans, the better. I want three. 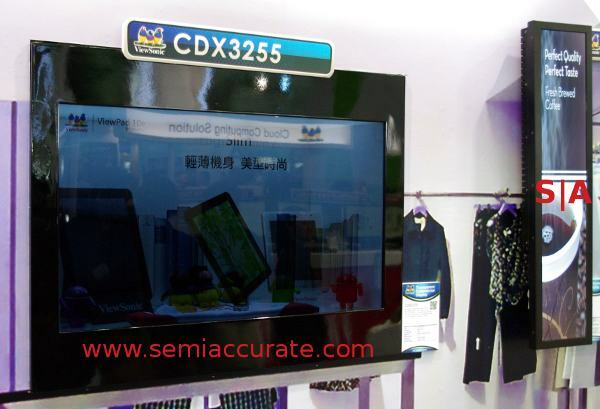 The last rather unique product is the CDX3255 non-backlit 1366*768 LCD monitor. It is not just non-backlit, it is also non-back anything, it doesn’t have a back. Instead, you get a semi-transparent ghost image over the android toys and pieces sitting behind the device. The two tablets in the center are images, the rest of the toys are real in a case behind the panel. This will never be mainstream, but the niche market of adult-content showing aquariums is woefully underexploited, pun intended. Joone, if you do this, I want to be there at the unveiling!